Delhi University and all its colleges, departments and faculties will remain closed for two days, March 5 and 6. These holidays were announced on account of Holi festival. All the libraries, including the university and college libraries, would also remain closed on these days. The offices, however, shall remain open on March 5. The examinations to be held on these days will be held as per the schedule already notified. Meanwhile, the Delhi University Teachers’ Association (DUTA) today organised a march to the sports ground to protest against the working of Vice Chancellor Deepak Nayyar. The teachers shouted slogans against the VC and also boycotted the function. The DUTA president, Mr Aditya Narayan Misra, said that they were going to issue a white paper listing the decisions of the VC in violation of the Delhi University Act, statute, ordinances and regulations. If the reaction of the select audience — which included the first woman Indian Police Service officer, Mrs. Kiran Bedi, and the former minister for Information and Broadcasting, Mr. Vasant Sathe — after watching the two-hour film Jeet, directed by Lavleen Thadani, is an any indication then the film has already scored its first victory. Mrs. Bedi, currently Civilian Police Advisor to the United Nations, who was in the Capital for the past one week, was visibly moved by the film and remarked d ‘‘What am I doing in New York, when there is so much to be done here”. The reaction of the others was no different. They were both awed and impressed — awed by the revelation that such brutal superstitions still existed and impressed by the surrealistic presentation of the malaise.. The movie, shot on locations in some of the remote villages of Bihar, Jharkhand, Madhya Pradesh, Chattishgarh and Andhra Pradesh, narrates the story of a woman and daughter branded as witches and how they fight the oppression unleashed by village witch doctors, particularly the ohjas. The film, according to Lavleen, symbolises victory over superstition. Lavleen is not an unknown name in the film industry: she has not only directed but also acted in, scripted and produced several movies. An alumnus of the Film and Television Institute of India, Pune, Lavleen has been awarded a Doctorate in Russian Literature by the Moscow State University. She headed the External Services Division of the All India Radio for several years, before devoting herself to full time film making to expose the social problems and superstitions still prevalent in some of the tribal villages of the country. THE ESSENCE: The Centre for Indian Classical Dances presented “In search of the Essence of India Journeys with a Bharatanatyam dancer” by Pallavi Saran Mathur at the Ashok Theatre, Ashok Hotel, here. This presentation was premiered by Pallavi Saran Mathur in New York on September 5, 2003, at the Lighthouse Center. The theme is the essence of India and “Indian-ness”. It attempts to explain Indian philosophy in small doses and in an easily digestible format, linking India’s rich traditions, its dance, music, art, architecture and sculpture with Life as seen on the streets of India today. The dances in this presentation are specially composed and choreographed by Pallavi’s guru, Sonal Mansingh. These have been correlated with vibrant images and commentary about the many impressive but sometimes confounding sights that confront a traveller in India. An attempt is made to unravel the common thread of logic and truth that connects them. 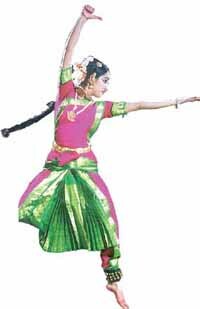 Pallavi has learned Bharatanatyam from Guru Sonal Mansingh for over 13 years. She has performed extensively with her Guru all over India, including performances at the Modhera Festival, the Somnath Festival, at Rajgir, Ahmedabad, at the Kumbh Mela at Allahabad, and in Ladakh for India’s frontline soldiers and airmen at the height of the Kargil war. Her most recent solo performances were in New York City on September 05, 2003, and at Chennai on January 12, 2004. In the words of Bharat Ratna Pandit Ravi Shankar, ‘‘She is such a wonderful upcoming artist — she is beautiful, she has all the correct guidance and we all feel she is going to be a wonderful dancer.....” Dance critics such as Mrs Leela Venkataraman have noted that she represents an excellent tribute to her guru’s training, which brooks no compromise or short cuts. Pallavi has also undergone several years of rigorous training in the Carnatic style of Indian classical music (vocal) under Mrs Radha Krishna, to complement her training as a dancer. Pallavi has recently graduated with English literature as her major from the Lady Shri Ram College for Women, University of Delhi. 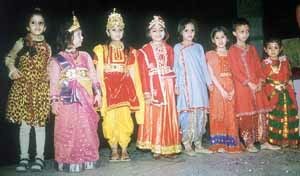 Samagam children dressed up as gods for a song from the film Baiju Bawra. TAB SE AB TAK: Samagam, a voluntary organisation devoted to the arduous task of propagating Indian art and culture, showcased five decades of the Indian cinema in two hours on stage. In those two hours, artistes young and old presented snippets from 51 award-winning films, enacted 19 scenes and sang 17 chart busters for the benefit of a select gathering of the Capital’s top industrialists and philanthropists. Among those who remained riveted to their seats during the two hour “walk down the memory lane” were Mrs. L. K. Advani, Mrs. Indu Jain, Ms. Peenaz Masani, Mr. G. N. Khaitan, Mr. H. KL. Somani, Mr. L. M. Thapar, Mr. G. N. Khaitan, Mr. Rajeev Sethi and Mr. Raja Reddy. What really impressed all and sundry were the costumes of the performing artistes — all 153 were painstakingly created to match the original ones in the films. The finale of the evening was “Rang Barse” number performed by none other than Shailesh Khaitan with a troupe of 120 dancers on the stage to usher in the festival of colours – Holi. T-series has released the music for the film ‘Main Hoon Na.’ This eagerly awaited film by Farah khan under the banner of Red Chillies Entertainment has music by the renowned Anu Malik. A collection of 8 songs, the lyrics are by the living legend Javed Akhtar. Big names of Indian music like Sonu Nigam, Alka Yagnik, Shreya Ghoshal, KK Abhijeet, Sunidhi Chauhan, Vasundhara Das and Ranjeet Barot are associated with this film. 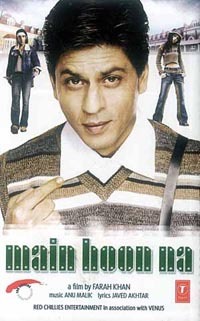 Side A: The first Song ‘Main Hoon Na’ has been sung by Sonu Nigam along with Shreya Ghoshal. The second song ‘Tumhe jo maine dekha’ is a soft romantic song sung by Abhijeet and Shreya Ghoshal. The next song, ‘Chale Jaise Hawaien,’ is a romantic number by K K & Vasundhara Das. The fourth song of this album, ‘Main Hoon Na,’ is a hot remix song sung by Ranjeet Barot. Side B: The first song of this side, ‘Ye fizaein,’ is a song by K K and Alka Yagnik. The second song, ‘Main Hoon Na’ is a heart touching number by Abhijeet. The next song, ‘Gori Gori,’ is a foot-tapping number by Anu Malik, K K , Shreya Ghoshal and Sunidhi Chauhan. The last song of the album, ‘Tumse milke dil ka hai jo haal,’ sung by Sonu Nigam, Aftab Sabri and Hasim Sabri is a hummable number. Tehzeeb treat: T-Series has also released the music album of the movie, ‘Tehzeeb,’ directed by Khalid Mohammed. A.R. Rahman has composed the music of this album and Javed Akhtar has given the lyrics. This cassette will be a treat for all music lovers. Meherbaan,’ is sung by the evergreen Asha Bhosle and Sukhwinder Singh and is already scorching the charts. The last song of this side, ‘I wanna be free,’ is sung by Anupama and Mathangi and the lyrics are composed by Blaze. Side B has 4 songs. The first song, ‘Mujhpe Toophan Uthaye,’ sung by Sujata Bhattacharya, is a soulful number. The second song, ‘Na Shiqwa Hota,’ has been sung by Vijaya. The third song is a traditional number, ‘Sabaq Aisa,’ and has been sung by Sujata Bhattacharya. It is an adaptation from Dagh Dehlvi. Asha Bhosle and Sukhwinder Singh have sung the last song, ‘Meherbaan Meherbaan,’ which again is a foot-tapping number and is likely to create a sensation. 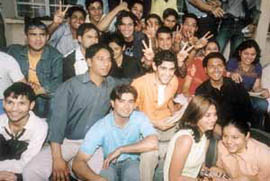 Gaurav Kapoor of Channel V with students in the Capital. To educate, involve and mobilize the young voters, the V Channel has announced the launch of ‘The Big Vote’. This has been done keeping in view the forthcoming Lok Sabha elections.